"Hey, now thanks for stopping by, you know it was worth a try". Even if Everything's Alright Forever is a stream of delightful moodiness it is full of hopes for the future and enthusiasm of youth. 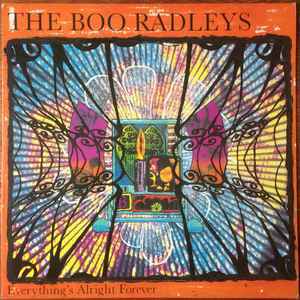 It is full bloom shoegazing but also tentatively psychedelic and these shy steps and uncertain gestures in the direction of psychedelic rock in combination with often melancholic vocals in the style of sad Beatles songs makes Boo Radleys different from so many other shoegazing bands of that period. So listening to these unhurried, slowly flowing songs never fails to put me in agreeably nostalgic mood: "Come stab it faster, the demon that's inside me. That’s what you’re after, do it quick - hurt me". my copy of this comes with a fold out tour poster...any information on this?